Hurry! 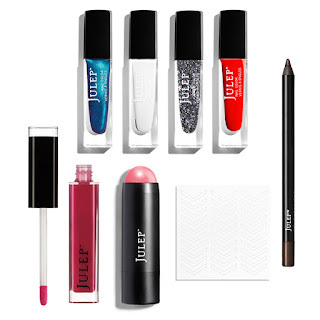 Only a few days left to sign up for Julep Beauty Box and get their Star Spangled 8-Piece Beauty Gift for FREE when you pay for your first month ($24.99). That's a $122 off free red-white-and-blue beauty! Use the products in the gift to get the perfect look for the long 4th of July weekend. Show your red, white and blue spirit with a patriotic themed nail for flag day, July 4th, or any event that displays the American Flag colors! 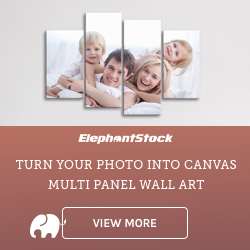 Looking for some red-white-and-blue inspiration for Flag Day or the 4th of July? Try one of these super-cute nail looks from Julep. You can get the polishes used in these looks for FREE in the Star Spangled 8-Piece Beauty Gift if you join Julep's beauty box subscription program. Or, if you're already a subscriber, then use code LETSGET20 to save 20% on any Julep polish or beauty purchase. Here is how to create your beautiful patriotic nails..
Easy - Patriotic Dots: Create your base with two coats of Myriam, a red crème polish. Let dry, then use a toothpick or a dotting tool to make dots with Brigette (the white polish), let dry completely, then add additional dots with Paulina (a peacock blue polish). Remember to extend the life of your lovely new manicure with top coat! More Challenging - Stars and Stripes: On all nails, paint two coats of Myriam, your red polish. Let dry. On your accent nail, use scotch tape as a guide to paint even stripes of Brigette (your white polish). I always make guidelines with scotch tape for my lines, or else they often get squiggly! Let your lines dry, then with a toothpick, draw blue stars on your accent nail with Paulina (your blue polish). For a Pro - Red, White & Blue Waves: Slightly more advanced. Paint half of your nail with Myriam, your red polish, and add a scalloped edge. Let dry, then apply the white scalloped paint layer with Brigette. Let dry, then finish with a third scalloped layer of Paulina (blue). Optional: Add a touch a sparkle on top of the blue with Kirby. Be sure to finish with a top coat to make your mani last and shine! Get all of the polishes (plus 3 beauty products) in a free Star Spangled 8-Piece Beauty Gift today! Use promo code FIREWORKS to get your free gift when you pay for your first month of Julep ($24.99).